My mom, bless her heart, is usually not so great at giving gifts. Well, let me rephrase-she’s good at gift giving, but has a bad habit of badgering her children into reluctantly telling her what they want from “santa”, then not getting those actual things, and instead getting random other things that were never asked for. I digress. 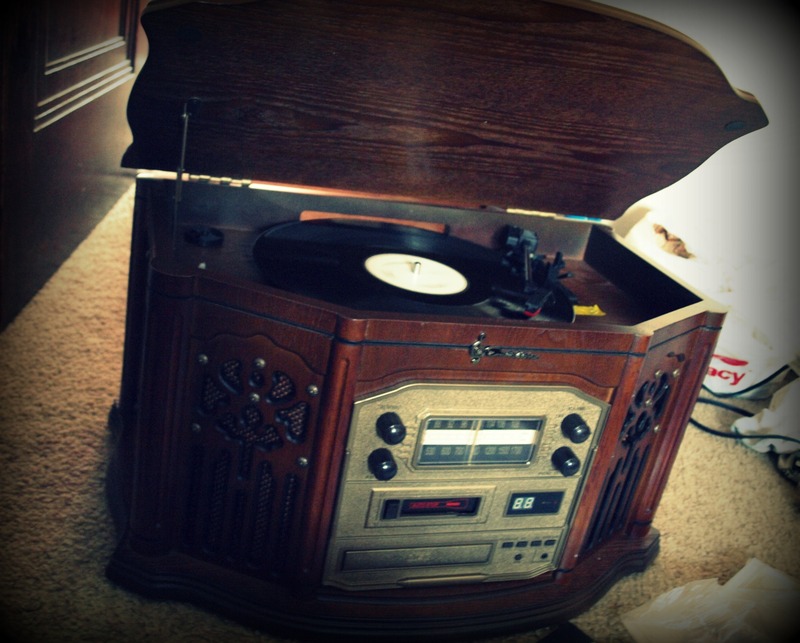 This present, a lovely record player (which also plays cassettes and cds! ), really made my holiday, especially because I’m an old lady now at the ripe age of 26, so really I shouldn’t be getting nice gifts from my mom. So if she ever reads this-thanks Mom! Love you! The new quarter started on Monday. I didn’t have too many good things to say about my classes so far up, and in fact was pretty discouraged until last night. My “Alternative Paradigms in Global Education” course seems like it’s going to be really great, and I’m very excited for it! I was nervous taking a class with so many doctoral students, but I think I’m going to be alright. They’ll keep me on my toes, if nothing else. As for my Monday night class….snore, but it’s required. And I’m not quite sure about my M/W afternoon class-it’s a heavy reading course load, with lots of work to turn in and, again, lots of Phd’s. Happily and interestingly enough, it’s the beginning of my classes for my graduate minor in women’s studies. I feel slightly fishoutofwater-y since my background is more in a lived experience being a feminist, lots of readings, etc, but no academic study, no theory. Hopefully I’ll be able to hold my own. It’s all going to take some work. My last class is tomorrow night (seriously, I hate having to take night classes solely because they aren’t offered during the day), so we’ll see how that one goes. First week almost finished, only 9 left until spring break! Lately I’ve been wanting to get back into a yoga practice of sorts, so today I also went down to the local studio Grow Yoga and signed up for a pass. I’m excited! Friday morning I’ll start. These sad, tight little runner muscles need some serious, serious stretching. Not being one for real New Year’s resolutions, I’m definitely trying to get back on track with my eating and exercise now that the holidays are over, Jon’s back in England (I swear, all we do is eat, explore and cuddle when we’re in the same country), and I’m back in school. All that crazy eating out was fun, but I was starting to feel pretty gross. But I guess that’s what the new year is for-new beginnings, fresh starts, all those wonderful cliches. And just to end on a happy note….this time next year I’ll be done with grad school! That’s enough to make 2011 a great year, in and of itself. Hope you’re all enjoying the first few days of 2011!